NEW YORK – November 7, 2017 – On November 16, La Piscine, Hôtel Americano’s popular rooftop coastal Mexican restaurant, will host the next installment of its ongoing Guest Chef Series. New Yorkers and hotel guests will have the opportunity to experience a special menu curated by Betty Vazquez, Riviera Nayarit’s culinary ambassador and one of the main judges on Mexico’s MasterChef TV program, in partnership with Hôtel Americano’s Executive Chef, Bryan Noury. Tickets are priced at $55 per person, and includes passed small plates, from 7:00 pm to 10:00 pm. In addition, Israel Diaz, one of Mexico’s top mixologist and ambassador for Riviera Nayarit, will create a cocktail menu to pair with this special menu. Chef Vazquez’s dishes and Diaz’s cocktail creations will live-on as part of a limited-time only menu at La Piscine from November 17 – December 3. The full menu will be announced at a later date. Chef Betty Vazquez is Executive Chef and owner of one of Riviera Nayarit’s finest restaurants, El Delfin, in Hotel Garza Canela. She is also one of the most popular judges on Master Chef Mexico, now appearing in her fifth season. She has been part of the formation of Riviera Nayarit as a luxury destination since its founding in 2007. Chef Vasquez started her culinary career at The Cordon Bleu School of Culinary Arts in Paris and apprenticed with world-renowned chef Juan Mari Arzak of three Michelin star Restaurante Arzak in San Sebastian Spain and has created her own culinary vision combining fresh Mexican ingredients and traditions with inspiration from around the world. One of the most renowned mixologists in Mexico, Israel Diaz is also the mixologist ambassador for Riviera Nayarit. He owns the Alquimista Cocktail Room, a bar in Nuevo Vallarta which offers a new concept in the city and showcases his cocktail creations paired with a small bites menu. Israel started his career as a chef and uses culinary techniques to craft delicious and creative cocktails that have earned him awards around the world. He regularly represents Mexico at major international diplomatic, gastronomy and tourism events. Chef Vazquez and Riviera Nayarit are part of Hotel Americano’s ongoing guest chef series, which most recently featured Sabina Bandera, whose street cart is considered “the best in the world” by Anthony Bourdain. Additional guest chefs will be announced this winter. 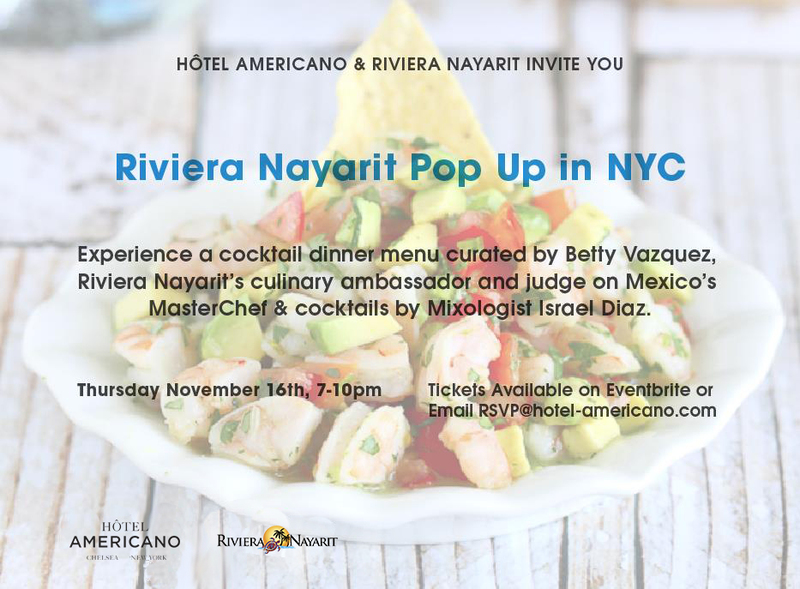 To purchase tickets for the event, please visit https://www.eventbrite.com/e/riviera-nayarit-pop-up-dinner-at-hotel-americano-tickets-39620954341?aff=eac2. For information on Hôtel Americano, please visit www.hotel-americano.com.